The nation has a limited supply of healthcare dollars to spend on drugs and services, which is why the government and health plans require scientific evidence of patient benefit. This is especially important for the 30.3 million people in the U.S. with diabetes, whose medical costs in 2012 totaled $245 billion. Gilbert found a way to submit claims for the procedure by dividing it into various component parts, such as “refilling and maintenance of portable pump,” “infusion into a vein for therapy,” and “established patient office or other outpatient visit, typically 25 minutes” in order to get paid. BlueCross Blue Shield in Alabama and Montana have stopped reimbursing for Trina treatments. inewsource has spent months investigating a California lawyer and his practices in promoting what he calls a “miraculous” procedure for reversing the complications of diabetes, a condition that affects 30.3 million Americans. 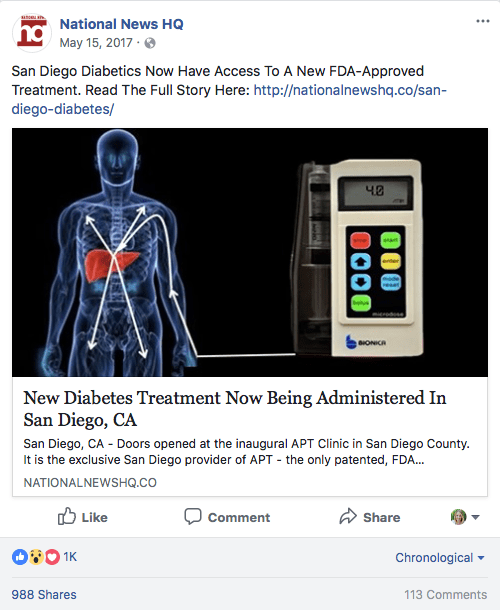 Senior healthcare reporter Cheryl Clark began asking questions about the insulin infusion procedure advertised by Trina Health after learning it was being offered in San Diego. The inewsource mission is accountability journalism, and Clark focused her inquiries on the risk of harm to patients and the cost to the healthcare system. She has interviewed more than 100 people for this investigation, including Trina founder and CEO G. Ford Gilbert at his Sacramento headquarters. Gilbert was charged with fraud and bribery in Alabama in a federal indictment unsealed April 2. Testamark told inewsource she doesn’t like that the infusion procedure requires her to be stuck nine times during the four-hour sessions. But, she said, her energy had increased “to the point that I just recently joined the Y, so I could get back into exercising again.” The pain in her legs? “It’s pretty much gone,” she said. Testamark said Medicare covered her Trina sessions. inewsource has spent months investigating G. Ford Gilbert, a California lawyer, and his practices in promoting what he calls a “miraculous” procedure for reversing the complications of diabetes. This is the first story in an ongoing series.